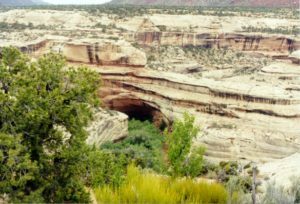 Natural Bridges National Monument is located in a desolate area in southeastern Utah, where the White River Canyon cuts entrenched meanders through the sandstone rock. Three natural bridges have formed where these meanders have been undercut, some of the largest in the world. 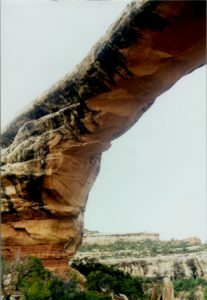 Sipapu Bridge is the first natural bridge you encounter as you travel the counterclockwise one-way drive into the Monument. 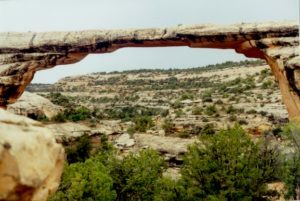 It is the second largest natural bridge in the world. Kachina Bridge is the second bridge, and is the least eroded of the three, with a sizeable, thick span. The third bridge, Owachomo Bridge, is considered the “oldest” in terms of the amount of erosion underneath the span. The bridge across the top is quite thin in comparison to the other two. 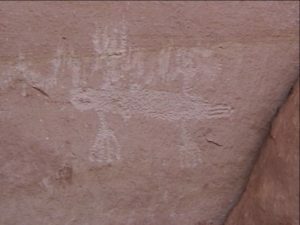 This being our second visit to Natural Bridges, we wanted to investigate Kachina Bridge, knowing that there were reports of an Indian petroglyph depicting a dinosaur at the bottom of the bridge. 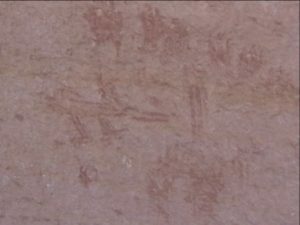 We did indeed find the petroglyph reported at various web sites thanks to the eagle eye of Liz Spaeth. In addition there were three more that we believe are depictions of dinosaurs. 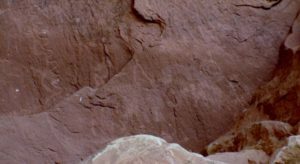 Two of the petroglyphs were of sauropod dinosaurs, and the other two it could be argued that they look like the Monoclonius or Triceratops with a nose horn and skull frill. We believe the second sauropod dinosaur petroglyph to be immediately to the right of the first, with its head turned back and its tail going underneath the neck of the first. 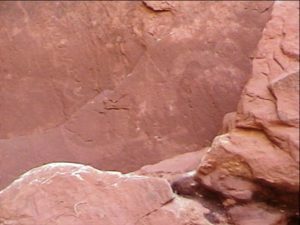 In 2016, we visited the site again, and the canyon had eroded 10 to 15 feet deeper, so instead of them being at eye level, we had to look up on the cliff face to see them. The trail to Kachina Bridge is 1.5 miles round trip and a descent of 500 feet into the canyon. You will approach the natural bridge and notice a guest book directly underneath the bridge to the right of the span. When we were there, the river was dry except for a few puddles. 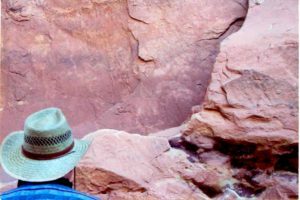 The two sauropod petroglyphs were on the right hand side of the bridge about ten feet up and twenty feet to the left of the guest book. BRING LOTS OF WATER. The Monoclonius petroglyphs were on the other side of the bridge about six feet up from the rock ledge in front. 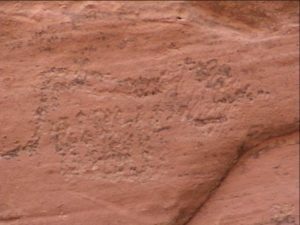 The two petroglyphs in question are connected by a wavy line. Petroglyphs and pictographs were very numerous, and to the left side of the bridge was a small ruin. We should be careful not to tout these petroglyphs as being more than class B evidence. Certainly we creationists can come the conclusion that the Indians were depicting animals they were familiar with and knew first-hand. Others might say that these are creatures of an Indian’s imagination, drawn while he was high on peyote, or, like what some evolutionists suggest about dragon legends, that they are vestigial rememberances passed down from our tree shrew ancestors. The horned dinosaur petroglyph could be interpreted as rhinoceros. These petroglyphs were fun to find and look at. 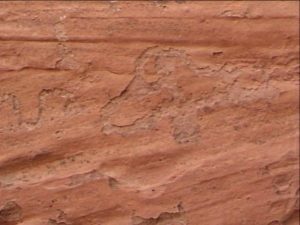 We could suggest a more serious study of them that would analyze the patina of the artwork to see if the amount of weathering corresponded to similar petroglyphs in the area. But we could see that by visual inspection. According to several books we found on the subject, many such depictions of extinct animals like these exist in Southwest Indian art. John Goertzen believes that the horned dinosaurs Triceratops and Monoclonius were the biblical Rheem, often translated as unicorn or wild ox. He speculates that these creatures may have been mammal-like and related to the rhinoceros. 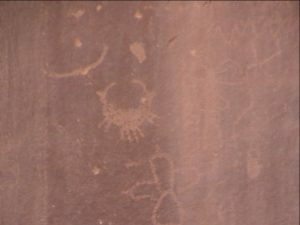 We hope that by calling attention to these petroglyphs that we are not risking the possibility that someone might attempt to destroy them. 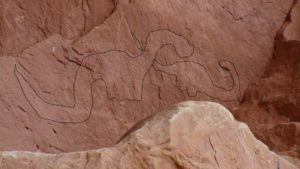 Please keep in mind that these are valuable antiquities, and the National Park Service has stiff fines in place for those who might deface these petroglyphs. The Monument is about 40 miles west of Blanding, Utah on state road 95, and about 40 miles north of Mexican Hat, Utah. 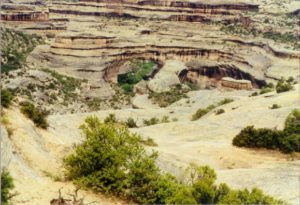 If you approach from Mexican Hat, be aware that state road 261 turns to dirt and climbs a thousand foot cliff in a series of precarious switchbacks. It is not recommended for large trucks or RV’s in either direction. We stayed in Blanding, where there is an excellent dinosaur museum.